Everyone has their fair share of high and low points in life. No one is spared and yet, nothing can compare with what St Peter experienced. Just last week, St Peter having declared through the guidance of the Holy Spirit that the Lord is the Christ and Son of the Living God, was in turn proclaimed by the Lord to be the rock, the foundation stone, the building block from which the church would take shape. No greater honour could be paid to any of the apostles. That was his high point! But this week, in a swift turn of events, the mood changes entirely. St Peter is now the agent of Satan, the stumbling block to those who might come to profess the same faith. Just like Satan, Peter is cast down from the heights. This unexpected transformation from building block to stumbling block, from an instrument to an obstacle, comes quickly – so quickly, in fact, that the two passages occur back to back in a continuous narrative of events. What brought about this turn of events? Having been identified as the Messiah, the Lord in today’s gospel begins to spell out how He is planning to accomplish His work of salvation. The nature of His mission would entail suffering, rejection and death. It was clear to the apostles that Jesus was the Messiah. The notion that He was the suffering Messiah was much harder to digest. It required frequent repetition from Jesus to make real to their minds the thought that their Lord had to suffer and be killed. It is no wonder that St Peter, who had just confessed that Our Lord was the long awaited Messiah, now pleads with Him to cease His madness, “Heaven preserved you, Lord,” or “God forbids!” “This must not happen to you.” The disciple who is meant to listen to the Master, now seeks to instruct the Teacher. St Peter found the cross offensive because he could not bear the thought that the Messiah, from whom he expected national deliverance, should be killed. The Jews thought that the Messiah would be a conquering king who will restore David’s throne in a temporal way. It was inconceivable to them that He should die at all. Therefore his reaction is quite understandable, quite normal. What Peter failed to realise is that the death of Christ was necessary, as the text tells us that “He was destined to go to Jerusalem.” The words ‘destined to go’ imply a constraint, an imperative, a divine necessity. His death had been planned and willed by God through all eternity. The prophets had predicted it and He must fulfil it. The Servant of God Pope Paul VI wrote: “In a mysterious way, Christ Himself accepts death... on the Cross, in order to eradicate from man's heart the sins of self-sufficiency and to manifest to the Father a complete filial obedience” (Apostolic Exhortation Gaudete in Domino, 9 May 1975). By willingly accepting death, the Lord carries the cross of all human beings and becomes a source of salvation for the whole of humanity. Peter couldn’t quite get it. None of the disciples could. Our Lord’s reaction to Peter’s attempt to give Him guidance was as sharp as it was instantaneous: He turned and said to Peter, “Get behind me, Satan! You are an obstacle in my path, because the way you think is not God’s way but man’s!” As one of my seminary formators once told a group of us, “If you are not on the Way, you are in the way!” By failing to follow the Master, the stepping stone had now become the stumbling block. Critics of the dogma of papal infallibility would be quick to point out that this passage supports their contention that the Pope is a fallible individual, quite capable of making mistakes like every other person. In this matter, to the surprise of many, we Catholics fully agree. For Catholic doctrine does not proclaim that the pope can never make a mistake in personal judgment. Infallibility does not extend to impeccability, the immunity from error. The Church does not deny and has acknowledged that Popes can make mistakes. It is only when he fully engages his authority as successor of St Peter speaking from Peter’s seat of authority (ex cathedra) in matters of faith and morals that the Church guarantees him to be acting under the charism of truth given by the Father through the Spirit. So, when St Peter publicly proclaimed “you are the Christ,” Jesus pointed out that this was not from him, but from the Father. This was an exercise of infallibility. But when Peter privately said, “Heaven preserved you,” the Lord notes that the source of this was from Peter himself. What’s worse, is that this human opinion was being used by the devil to tempt the Lord to choose comfort and honour, over suffering and sacrifice. Of course, He will have none of it because He knew that glory comes only after sacrifice. And His own sacrifice will not make things easy for His disciples, rather it will blaze the trail of sacrifice that they too must walk. The sacrifice that He will offer will be Himself. The sacrifice they will be called to offer will be similar. The fate of the Master must now be the fate of the disciple, for this is what it means to “follow” Christ. After rebuking Peter, our Saviour called together all the disciples, and made it clear that not only was it necessary for Him personally to pass through the mysteries of His Passion, Death and Resurrection, but that anyone who followed Him would have to do the same, if he wanted to be saved. “If anyone wants to be a follower of mine, let him renounce himself and take up his cross and follow me.” This is what makes the cross equally offensive today, even for those who call themselves Christians, followers and disciples of Christ. Why would the cross remain offensive? The answer lies in our taking up the cross. The cross becomes an offense when Jesus says, ‘You, take up the cross and follow me.’ You see, the cross was not only for Jesus. The cross of Christ means your death and my death. “For anyone who wants to save his life will lose it; but anyone who loses his life for my sake will find it. What, then, will a man gain, if he wins the whole world and ruins his life? 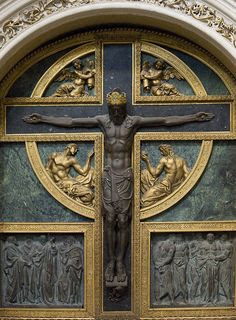 OR what has a man to offer in exchange for his life?” In the midst of the many voices clamouring for our time, our money, our allegiance and our attention, we are called to choose the cross, we are called to choose Christ to the complete dispossession of all else. The life you long for, the changes you want, come only through the cross — no other way! If you will live at the cross, the cross will take care of the rest. This is a great challenge for each of us. In the midst of our chaotic lives, Jesus stops and says, “You have to choose.” We all struggle with this. We struggle with choosing safety over risk, comfort over sacrifice and self-interest over caring for others. And yet, we are called to share, to forgive, to be merciful, to be obedient, to be righteous, even though these things may not profit us as the world defines profit. We are to pick up the cross and willingly sacrifice everything for others. In His call to authentic discipleship, Christ challenges our most precious loyalties. As there can be no other gods before the God of Israel, there can be no other loves before Christ. Thus, there is a cost to following Jesus, and the curious and half-hearted should take notice. Discipleship may cost us everything, but it will gain for us all that will ever matter.